In the cryptocurrency world, Bitcoin is clearly ahead of the pack, both in terms of popularity and overall market value. While Ethereum has been closest behind in second place, Ripple temporarily usurped that position on Friday, December 29, as the second leading crypto in terms of market cap. 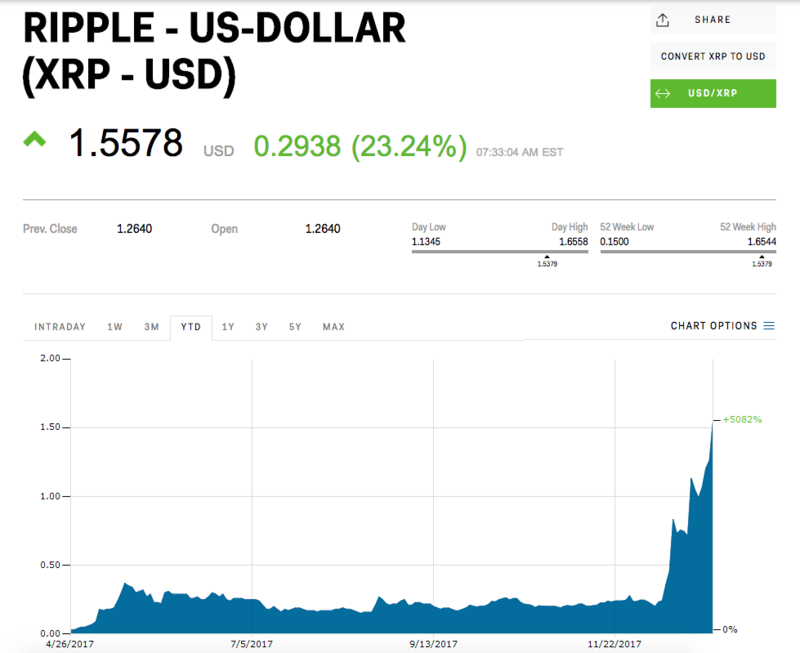 Early on the 29th, Ripple experienced gains of over 40 percent. While this was temporary, it showed that the crypto, which primarily focuses on bank transfers, is a fiercer competitor than some may have given it credit for. At its peak around 6 AM Eastern time Friday, Ripple overtook Ethereum with a market cap of $73.65 billion, according to data from CoinMarketCap.com. All great things must eventually come to an end, and Ripple’s second place run ended in a matter of hours. But, while Ripple fell back into third place relative to others, the crypto is still up about 61% over the past week and over 5,000% this year. This digital currency has been rising throughout the year, after recent news of a new consortium created by Ripple’s Asian subsidiary and a group of Japanese credit card companies led to increased interest. This consortium is looking to bridge the gap between credit card use and blockchain technologies, hopefully merging credit card use with distributed ledger technology. So what does this mean for the future of Ripple? Well, it in no way spells that Ripple is bound to overtake Ethereum again, or Bitcoin for that matter. But it does show two things. First, it shows how cryptocurrencies, in general, are gaining traction. Public trust and investments are at an all-time high and only climbing. Secondly, it speaks to the momentum behind incorporating blockchain-based technologies in everyday transactions. Perhaps, if this momentum continues, crypto could be a daily part of our transactions and our lives.